I splurged. I bought something off the rack at high season at retail pricing. Yikes. Completely against just about everything for which I stand. But sometimes you have to do it. Particularly if the item is something classic, stylish and sure to sell out quickly. From J. Crew no less. It’s pretty lightweight thanks to the high cotton content. And today it will barely crest 70ºF here in Central Virginia. Sure tomorrow will begin the seasonal heat as the temperatures and humidity creep ever higher. But in my mind, I’m basking in the late spring sunlight on the Riviera. This entry was posted in Elegantology and tagged French Riviera, J Crew, Richmond VA, St Raphaël FR. Bookmark the permalink. When you find the perfect thing you just have to get it. Price is not the most important consideration.I like both the photos. At what age did you start to think about dressing stylishly – single figures ? It looks great! Sometimes “now” is the most important part. Parthenope, it’s been as long as I can remember. But my definition of stylishly has changed with the years. I started to prefer classical styles of the ’30’s in the early nineties. Although I always had a thing for classical movies and I’m sure that influenced me early on. My father was a very well-dressed man when in “civvies” and a good role model. Like the look, but J.Crew? I want to wear in my own clothes, not buy them that way. I feel it’s a cheat, trying to assume a look you didn’t earn. Love the sweater though, I bought one myself years ago. Afraid to wear it, you know what they say aobut horizontal stripes! And a lightweight sweater for summer seems like just the thing. If you look at the forecasted lows for the upcoming week, it appears you have a discovered a perfect way to deal with them! 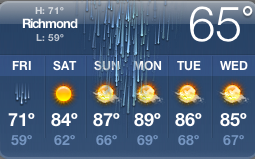 It can’t be sunny and humid all the time, right? Quick follow up. I’m not accusing you of cheating! I just don’t like that philosophy, so I have a difficult time supporting J. Crew, which promotes it. And I do buy things from there, just not the pre worn/broken in items. Hi Nick, I don’t buy the pre-worn things either, sticking with tailored pieces or knits, etc. The sweater is a very light weight one of fine gauge. You can see your hand through it if you hold it up to the light. The wool content, though small, should help it to hold up longer than most cottons. I bought the sweater as well- $62 isn’t bad, when you consider it’s P.P.W. in the photo of you on the stairs- espadrilles? what are those on your feet? I wore practically the same thing! Black linen pants, white polo, blue & white sweater, black sandals. It was breezy and cool here yesterday, with NO humidity. It’s back today, though and getting ready to storm again. UGH!!!! 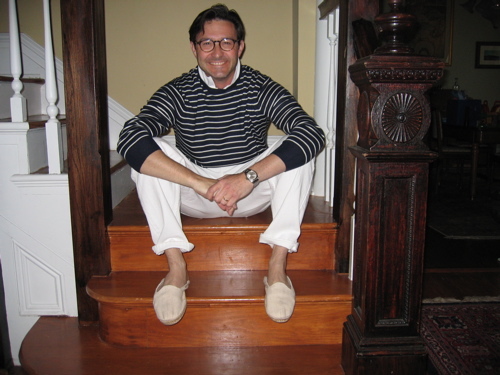 Hello Mr. Ronfeld, yes, they are espadrilles. I wear them a lot, especially in the summer. These were actually purchased in Spain and are of a very heavy cotton twill. P-D! Great minds. It’s HOT here now.90ºF. But the sweater will take the chill off of the a/c. The outfit is great! Very nautical! Also it is artistic. French Breton shirts have been always popular with artists including Picasso and Gerald Murphy. This is a wonderful look. Typical of how the simplest things often look the best. The greatest designer of our time, Yves Saint-Laurent, once said in a Vogue interview that he was surprised whenever he got the most applause for the simplest outfit. He often did trenchcoats, and he would usually put black flannels and a black turtleneck underneath. He said that that was always the most popular ensemble of the collection! 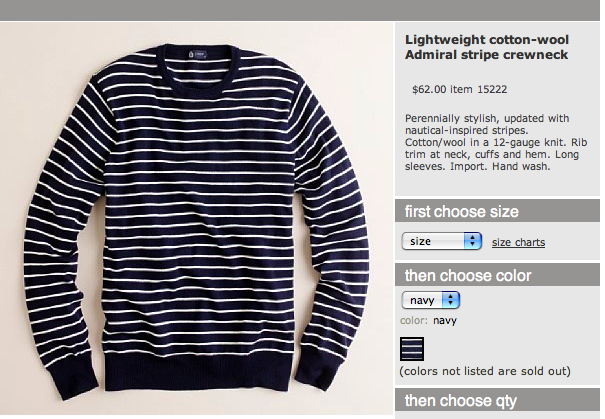 The classic French nautical sweater is a look you cannot go wrong with. When I was exploring vintage clothing shops in Paris, they always had a rack of these iconic sweaters…always in variations of cream white, red, and navy, with subtly different widths of stripes. In France you see racks of these striped sweaters the way American vintage shops always have a rack of western shirts. 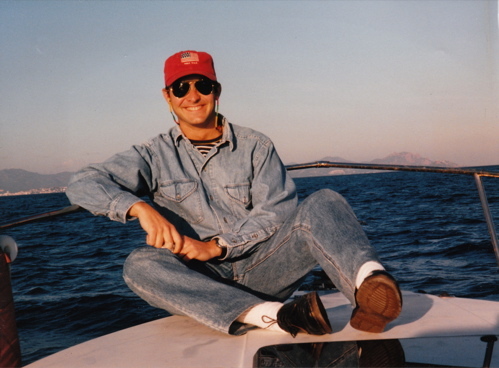 Top designers continue to adapt and borrow this nautical striped sweater look, notably Yves Saint-Laurent, Sonia Rykiel, and Ralph Lauren. To keep it looking best, hand wash in sudsy look warm and blot dry in a towel. No dryer! And if you want to have this wonderful look but the temperature is too high, you can always drape it over you shoulders. I’m glad you treated yourself. So often I’ve waited and as you say, the item gets sold out. I agree with the previous comment about items being uneccessarily distressed. I hate when jeans or khakis are already frayed at the hem or pocket seams. All that means is that they will fall apart 50% sooner. I recently wanted a terrific pair of J. Crew critter pants, and bought them longer so that I could have the frayed, distressed hem cut off. Next they’ll want to sell us rusty cars! Double denim and Doc Martins???? Flag hat?? I am so disallusioned. Please tell us your bags were stolen. You don’t need to defend the denim, denim and Doc’s. Even Diana Vreeland said “blue jeans are the most beautiful thing since the gondola”. Hello Mr. Ronfeld. I’m not a huge fan of blue jeans. But they come in handy. It also turns out that the boat that our friend took us out on wasn’t actually his. The owner was “away…” Hmmmm. I could’ve posted the photo of me on the 41′ sailboat wearing faded reds and a battered Golden Fleece polo, but what the heck. Somedays it’s blue jeans and Docs; somedays it’s a blue blazer and white ducks. My Uncle just finished third in his class at the Annapolis-Newport race! no, please post the pic of you wearing faded reds and the polo. or any proof that in 1996 you were wearing something else besides a Canadian Tuxedo… and a baseball cap… and Doc Martens.. with white socks. I think you look terrific in all of those pics and all the others too! AND THE POST MADE ME SMILE AS I REMEMBER YEARS AGO, COMING FROM NEW YORK, HOME TO BEVERLY HILLS FOR CHRISTMAS AND SEEING AN ENGLISH, VERY CASUAL VARIATION-ON-A-WINDBREAKER COTTON JACKET AT A VERY PRICEY BH STORE. IT WAS ON SALE AT A CONSIDERABLE AFTER CHRISTMAS DISCOUNT AND I TRIED IT ON AND IT WAS REALLY, REALLY BEAUTIFUL AND FIT IN A WAY THAT NOTHING ELSE HAD REALLY EVER FIT. HOWEVER, EVEN WITH THE DISCOUNT, IT COULD”VE BEEN THE DOWN PAYMENT ON A CAR SO I DIDN’T BUY IT. I WENT BACK TO NEW YORK, WHERE I LIVED, AND CONSTANTLY THOUGHT OF THE JACKET! ON MY RETURN TO BH LATER IN THE YEAR, I WENT BACK TO THE STORE TO SEE IF THE JACKET I’D ACTUALLY HAD DREAMS ABOUT WAS STILL THERE. IT WAS AND IT WASN’T ON SALE BUT WITHOUT HESITATION, I BOUGHT IT AT FULL PRICE AND NEVER LOOKED BACK, NEVER REGRETTED IT, AND STILL TO THIS DAY, LOVE AND WEAR AND FEEL VERY VERY SPECIAL WHENEVER I PUT IT ON. IT STILL GETS COMPLIMENTS TOO. YOU DON’T WANT TO, YOU HAVE TO! !